Make doll clothes for American Girl, Bitty Baby, Wellie Wishers, and more with these free sewing patterns. From dresses to diapers, jackets to jammies, these tiny fashions keep dollies looking cute! Buying clothes for dolls can get expensive, but if you have a little sewing experience, it's not too difficult to make them. Plus, when you find a few patterns you like, you can customize the designs with different fabric and a few extra details. Then the same patterns take on a new look! 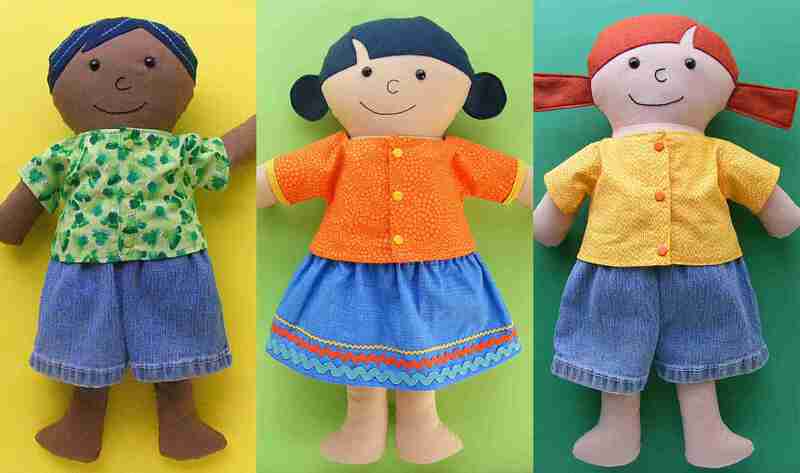 No matter what size doll you want to craft for, this list of free patterns has something for you. Plus, many of the links lead to sites with even more patterns for free or at a reasonable cost. Before long, you can make a whole new wardrobe for your dolls! Wendi Gratz from Shiny Happy World shows you how to make these cute separates. They perfectly fit her Dress-Up Bunch dolls, which she sells the patterns for, but you could fit them to other dolls too. These really are easy to make. Plus, she shares a tip for giving denim doll shorts details from the real deal! When you find a pattern that works in more than one way, it makes sewing doll clothes even easier. With this basic dress from the Craft Patch, you can learn how to make it once, then create several styles, including a doll nightgown! In fact, you could even use this to sew up some tops with varying sleeve lengths. These little jammies for a baby doll look so snuggly! And the trim around the hems looks great. The two pieces of these jammies are in two separate posts, so don't miss either the top or the bottom. As with almost all the designs in this list, look for other ways to adapt the pattern. Because these styles don't have to just be jammies! Pixie Faire offers an extensive catalog of amazing clothing and accessory patterns for both 14- and 18-inch dolls. Most have a small price tag, but a few are free like their Trendy T-shirt. 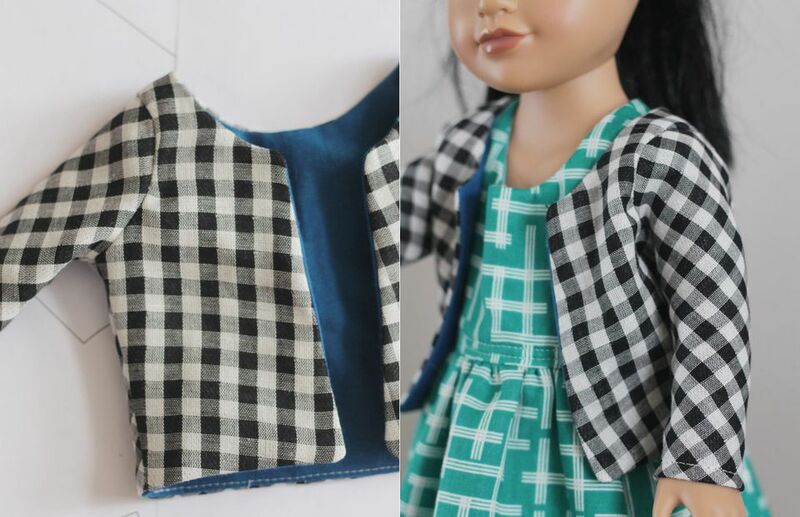 Plus, if you don't feel ready to make every piece of clothing for your doll, their sister site Liberty Jane Clothing offers many of the same styles as finished items for you to order. Changing a baby doll's diaper is a great skill for kids to practice, but the disposable kind can be expensive and wasteful. Instead, sew up a few of these cloth diapers with hook and loop closures. Not only are they reusable for lots of pretend play changes, but they're cute too! Oliver and S makes adorable clothing patterns for kids, and they even have cute patterns for doll clothes! This skirt can be adapted for 13 to 14-inch dolls, and they have a few more designs for other size dolls too. Leggings for real people are easy to pull on and wear, and the same is true for dolls. You can make these to go with all kinds of outfits, and if you work with stretchy denim-like fabric, they look like jeans or jeggings! This sewn cardigan or jacket pattern is a great way to dress up your favorite 18-inch doll. The example keeps it pretty simple, but you could add a few itty bitty buttons or some other details to create a miniature garment that is reminiscent of the clothes made by large brands, but infinitely better because you make it yourself. Rather than giving you a pattern to make a swimsuit for a specific-sized doll, this tutorial teaches you how to make swimwear for any doll. And not only can you customize the size and fit, but you also learn how to change up the style with fun details! Sweet little baby dolls look even sweeter when they're dressed in a sundress with tiny bloomers! It's sized to fit a 12-inch doll, but you can easily adjust the pattern size to fit other dolls too. Want to add a few more details? Try sewing some ricrac along the bottom edge for a design element that's cute and child-safe.